A select collection of the most exquisite luxury villas for rent in Koh Samui,The Private World personally visit and inspect each villa in our listing with a minimum number of 4 bedrooms and up. 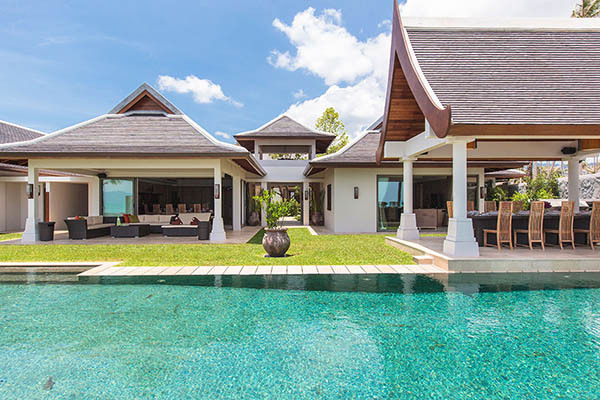 Our luxury Koh Samui villas rental feature 5-star facilities including a private pool, gym, spa, cinema room, entertainment areas, among others. Fully-staffed with a full-time chef, a dedicated villa manager, housekeepers, and a guest experience specialist is available to assist you throughout your stay and to provide you with a personalized holiday experience. We offer the best possible rates. Book direct with us. Some of the most luxurious private villa rentals in Koh Samui are discovered along the island’s rich coastline, with exclusive beachfront stays and outstanding clifftop rentals with dramatic seascapes and green vistas that inspire a deep sense of relaxation. Koh Samui’s luxury villas are as varied as they are beautiful, ranging from contemporary, designer-chic four-bedroom escapes to magnificent nine-bedroom getaways that promise a delicious slice of pure tropical beauty. Unique settings, with incredible designs, and extraordinary interiors, Koh Samui’s luxury villa facilities truly shine too. Savor al fresco dining and lounging experiences as the sun goes down over another perfect day. Embrace the villa vacation lifestyle with infinity pools and incredible open-plan living and dining rooms, while some stays boast gyms, private cinemas, games rooms, and lawns with outdoor terraces and salas. The attention of an in-villa personal butler, housekeeping staff, a private concierge, and private chef for intimate dinners can elevate the luxurious villa experience beyond your imagination. Spa treats at your villa, as well as an early morning or sunset yoga sessions by the pool, complete your vision of vacation-villa perfection. What is wonderfully surprising about Koh Samui is the possibility of finding your own secluded oasis. The north and north-eastern side of Koh Samui is known for its high-end stays and fabulous beaches close to the airport. Pretty Mae Nam offers a relaxed vibe with restaurants and cafes as well as a walking-street market, plus long stretches of coastline, without the hubbub of a frenetic nightlife. Along to the east, Bophut is renowned for its attractive and charming Fisherman’s Village and tranquil ambiance, whilst Choeng Mon a handful of eateries and is a peaceful haven with stunning views afforded from clifftop villas. Bang Rak boasts bars, restaurants, and one of the island’s piers as well as being close to the amazing Big Buddha temple. Meanwhile, heading north, the picturesque and serene Plai Laem is renowned for its magnificent temple, huge white Buddha statue, temple lake and, facing the west, its glorious sunsets. On the east coast, Chaweng is the epicenter of Samui’s holiday hedonism with an upbeat, party atmosphere. Further down the coast, Lamai is the island’s second biggest resort destination, yet far quieter than the energy of Chaweng. On Samui’s west coast, Lipa Noi and Nathon balance beautiful beachfronts with a good mix of restaurants, bars, and shops, making these destinations perfect for families looking for relaxation and some life too. Down towards the south, Taling Ngam looks out to the wondrous Angthong National Marine Park. With its jungle landscape and exclusive villa luxuries, this part of Samui is absolutely marvelous. Meanwhile, nearby Laem Sor is renowned for its stunning beachfront pagoda and is the ultimate island getaway destination far from Samui’s tourist hotspot. Samui’s beaches are glittering stretches of soft, white sands; dream beachscapes with turquoise waters lapping at achingly beautiful shores. With islands offshore waiting to be discovered, each of the Samui’s own beaches promises its own unique charm. Mae Nam Beach is a good swimming beach destination in the north, with views out to Koh Phang Ngan and sands that are seldom crowded. Continuing eastwards, Choeng Mon Beach is an expansive two-kilometers long with an undeveloped air as well as a small island close-by that can be reached by kayak, and some snorkeling spots too. Bophut also retains this natural, unspoilt character. Over to the east, Chaweng Beach is seven-kilometers of stunning beachfront and perfect for water sports, luxury lounging, and enjoying a beach-party vibe. Two small bays that are close to the action, yet quiet beach escapes, are Samrong and Tongsan, near to some of the island’s finest luxury villa stays. Coral Cove Beach is a grand display of Samui’s granite boulder-strewn coastline in the east, with deep waters and a rugged charm. Heading down from here, Lamai Beach is a great spot for enjoying a good choice of beachfront dining. The southern beaches of Samui are far more secluded than anywhere else on the island and Thong Krut Beach exudes an air of authentic nostalgia with longtail boats setting out to explore nearby islands. Taling Ngam Beach, in the south-west, which means ‘beautiful shore’ looks out to spectacular Angthong National Marine Park and its 42 island jewels; one of the most peaceful and idyllic parts of the whole of Koh Samui, Meanwhile, Lipa Noi Beach, home to the iconic beach club, Nikki Beach, is also popular with families due to its shallow waters and fine sands. Samui is a sun-drenched island year round, where humidity is high and temperatures also stay high, with the lowest average being around 24° Celsius up to around 33° Celsius. The tropical Gulf of Thailand climate is generally split into three distinct seasons, however there is definite blurring between these seasonal shifts. Perhaps the best time to visit Samui is in the first couple of months of the dry season in February and March. From the end of March Samui sees the hottest temperatures leading into the start of the monsoon rains. Often downpours are short-lived and sunshine days are followed by dramatic thunderstorms in the afternoons and overnight, which can add fabulous variety and be a welcome break from the hot sun. The low season in October and November, when the rains fall the most, is an ideal time to visit for those looking for out-of-season solitude, with fewer visitors and more space to soak-up Samui’s secluded-island atmosphere. Come December, all the way to March, Samui hits the sweet spot, with dry days, light sea breezes, and warm temperatures that make outdoor activities more enjoyable. During the high season, Samui’s luxury villas beckon as private and cool retreat stays. Koh Samui beckons with lots of incredible attractions for you to experience. A highlight of your stay may be island-hopping and touring the breathtaking scenery of the Angthong National Marine Park, with jungle-clad islands such as Monkey Island and Sleeping Cow Island as well as the picture-perfect Emerald Lake on Mother Island. Other natural beauty spots include the grandfather and grandmother rocks with their fascinating folktale backstory, while Namuang Waterfalls is a great stop-off where you can cool down, take photos of the purple rocks and enjoy a picnic. The 12-meter, golden Big Buddha seated image is part of a temple and is a great viewpoint at dusk. Another must-visit temple is Wat Khuraram which is famed for its mummified monk, locally born Luong Pho Daeng who passed away over 45 years ago and is a much-revered monk in Thailand. You can also explore statues and Buddhist scriptures at the privately owned Secret Buddha Garden, a small, green, and tranquil setting with a stream and stone carvings that create a magical ambiance. The quaint, inviting shophouses of Samui’s Fisherman’s Village are definitely worth a visit and are home to fantastic boutiques as well as bars and restaurant. Activities for families include safaris discovering Samui’s rainforest interior, ziplining adventures, and cooking classes. For yachties, there is an annual five-day Samui Regatta, and if you are a watersport fan, you can try everything from scuba diving to kite surfing and flyboarding, along with sunset cruises. In the evening, gourmet dinners are served in romantic dining rooms, on outdoor terraces and on the soft sands of beautiful beaches.